This chunky chicken soup-stew has been a favourite winter dish since medieval times, a recipe for it first appearing in print in 1598. It is a common feature at St. Andrew's Day feasts, Burns Night suppers, and Hogmanay dinners. 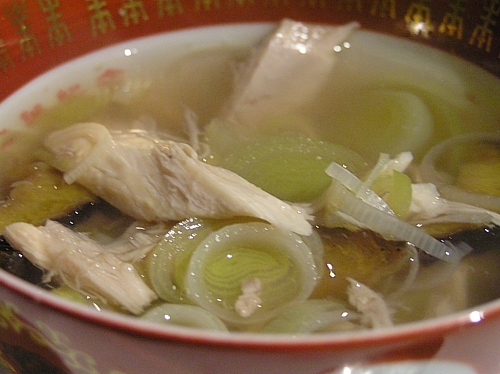 The name, which is derived from the two main ingredients, boiled fowl and leeks used to add extra nutrients to the broth, began appearing in the eighteenth century. While this soup is traditionally flavoured with prunes, many people omit them according to their tastes. The following recipe serves four and is taken from CanadianLiving.com. Add chicken stock, rice, lemon peel, bay leaf, and prunes; bring to boil. Reduce heat and simmer for about 20 minutes or until rice is tender.